Better street lighting can help reduce emissions, save money and improve safety, but national support for cities is critical for overcoming the technical and financial barriers. Photo by pang yu liu/Flickr. Lighting represents about 15 percent of global power consumption and 5 percent of worldwide greenhouse gas (GHG) emissions. Street lighting alone represents about 3 percent of world electricity consumption. Extensive programs that replace obsolete street lighting systems—incandescent, mercury vapor, and sodium high pressure vapor—with more efficient technologies—ceramic metal halide and LED lamps—can have a huge impact on energy consumption and GHG emissions. But these programs, particularly in developing countries, often need the help of external actors to ensure that projects will move from the planning stage to completion, given that many cities lack the necessary funding and technical capacity. While this help can come in the form of public-private partnerships, national governments can implement these initiatives at a greater scale. National support also allows cities to retain control of street lighting system and take full advantage of the economic benefits of improved lighting. Enabling cities to enjoy these benefits will require national governments to develop a strong institutional framework that can help cities overcome the technical and financial barriers to better lighting. 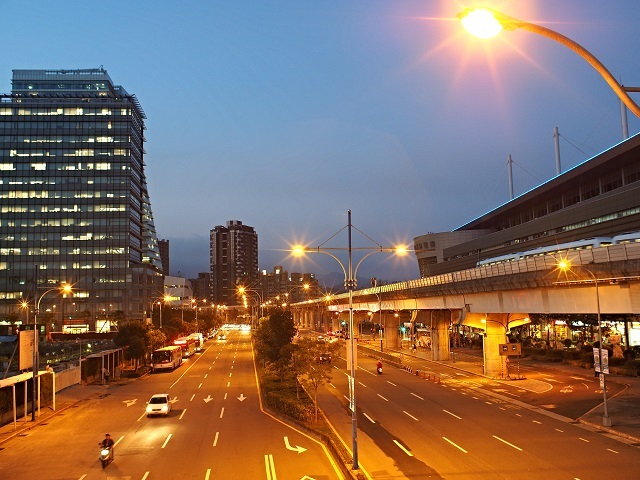 Improving street lighting is a cost-effective measure for more energy efficient cities. Because implementation can be relatively quick and produce immediate results, it’s often considered a low hanging fruit. A study in Mexico, estimates that retrofitting lighting generates the largest net economic benefit per unit of reductions to carbon emissions. Lighting in developing countries consumes about 10 times less energy per capita than the United States and Canada. However, this does not mean that street lighting is not important for energy reduction. At the city level, street lighting still could amount to 10-20 percent of the electricity bill in most countries, and it could be as much as 50 percent in some places, largely due to inefficient technologies. Furthermore, improved street lighting can help reduce crime, improve safety, and revitalize communities as a whole, as more light means that potential crime areas are better lit and more people feel comfortable on the street at night. Some studies shown a 21 percent reduction in crime in areas where street lighting was improved. Similar studies show a 45 percent reduction in pedestrian traffic crashes thanks to street lighting—and the impact could be even larger in countries with high rates of road traffic incidents, such as Ghana. Despite this potential impact, cities encounter barriers to improving the efficiency of street lighting. Two of the largest hurdles include capital costs and a lack of technical expertise, as municipal governments frequently voice concerns about the performance and reliability of new technologies, product selection and the performance and reliability of equipment providers. National policy frameworks and incentives can help overcome these barriers by enabling access to funding and technical capacity. But this support needs to be delivered without imposing tedious and long administrative processes. 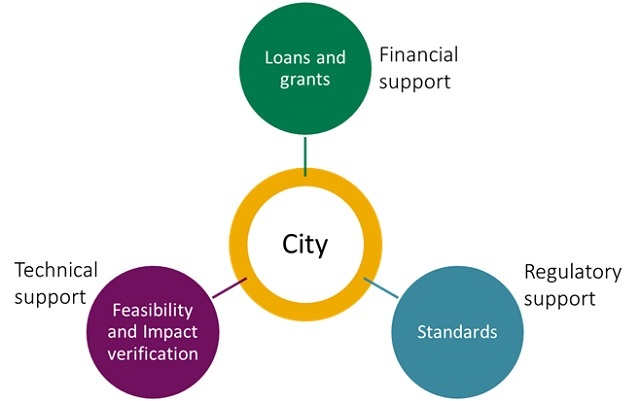 Three areas where national support can help cities move forward with low-carbon action. Graphic by Rodrigo Villarroel Walker. Through a project led by the National Commission of Energy Efficiency since 2010, Mexico has replaced 270,000 lightbulbs in 17 cities, benefitting 4.4 million people. The program saves nearly 36,000 metric tons of CO2 emissions every year and these cities now spend 37 percent less on average on street lighting. Loans are provided by the Bank of Public Works and Services, and municipalities can access grants from the Ministry of Energy through the Energy Transition and Sustainable Energy Use Fund, covering up to 15 percent of the investment or 10 million Mexican pesos (whichever is lower). The National Commission of Energy Efficiency and the Federal Electricity Commission provide technical assistance to assess the feasibility and impact of potential projects. The program use innovative tools that help inform the procurement process and evaluate the energy and climate impacts of projects. A critical component of Mexico’s support is ensuring high-quality technology and an efficient installation process. The national government developed standards—such as a national official standard for efficient street lighting, NOM-013-ENER-2013—and partnered with the National Chamber of Electric Manufacturing to recommend certified equipment providers. An additional 28 cities in Mexico are in the process of transitioning to more efficient street lighting, and there are plans to keep expanding the program to other municipalities. The program’s success is the result of an institutional structure that reflects national objectives—which are outlined in the Law for the Use of Renewable Energies and Financing of Energy Transition (LAERFTE) and the Law on Sustainable Energy Use (LASE). Technical, financial and regulatory support from national governments can be critical to accelerating the transition toward more energy efficient cities. By carefully structuring support for local priorities like street lighting, national decision makers can create a range of economic, environmental and social benefits. Moreover, this model of supporting cities with national programs can help scale up other energy solutions such as solar water heaters and rooftop solar PV. Street lighting is just one “low-hanging” starting point.